The Four Season Westlake is a gorgeous venue for Indian weddings. The ceremony area is situated just in front of a waterfall backed by a wall of pine trees, and the seemingly endless grounds seem draped in serenity and calm. This Indian couple were both super happy throughout their wedding day, so they were adorable to work with. This lovely photograph captures the moment where the bride and groom are told to sit down right after circling the fire multiple times. Whoever sits first will have the upper hand in the marriage. Of course, the bride always wants to win, and in this case, she did. You can see that she is already smiling because she sat down first. Her groom doesn't even know what happened. I also loved their beautiful garlands, which involved a stunning array of colors and flowers. The Hindu ceremony took place under a pink mandap, while the reception decor showcased the same colors shown in the couple's garlands. 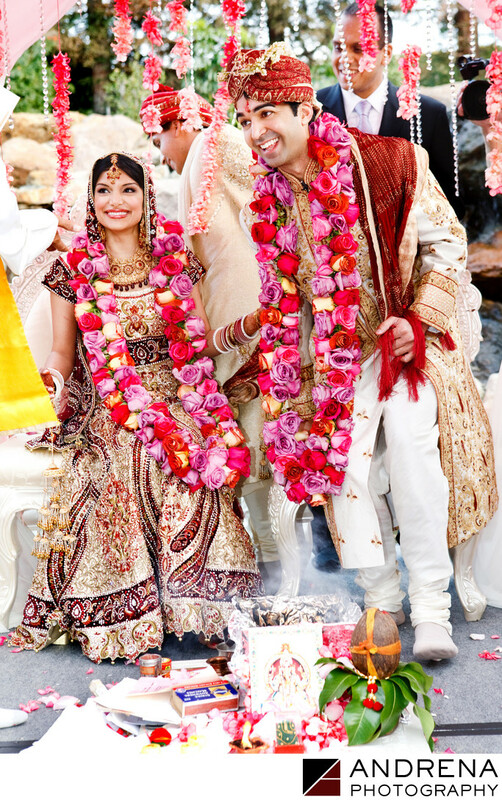 M's Flowers handled the florals, while the wedding itself was coordinated by Sonia Sharma Events. Ruben's Special Cakes created the Russian-style cake, which was just so creative. Indian wedding photographed at the Four Seasons Westlake Village in Westlake Village, California.